Usually when I make the trek down to the monthly local card show, it is done with the goal of catching up with some fellow hobbyists, mild window shopping and maybe a spur-of-the-moment pickup. Occasionally I come home with an item or two that can help scratch off a couple wantlist lines. This past weekend though, I got to check out some fun goodies. New guy set up at the show and he had a whole bunch of 80's and 90's singles. Monster box upon monster box. It looked as if he took his childhood and plunked it on a table hoping to profit from a few sales. He also had a showcase with a few higher-end items and that's where I saw a row of Parkies. Ungraded......and just in the condition that I'm looking for. They weren't marked so I inquired about the prices. He made it sound like he didn't even really want to sell them. Just a quick heads up....if you put it out on the table, prepare to sell it. I asked to check them out. At very least I could take a closer look at some of the pieces of cardboard. There was a Meeker (got it), a Broda (got it) and a Boom Boom (need it) but the Geoffrion wasn't going to come home with me today. I did notice that he had two copies of a card and so I took a stab at it. A quick back and forth and it was a relatively easy sale. Yes, he's a common......but you need all the cards to complete the set. I think this is a real solid addition to the collection. Decent entering, nicer corners than a few of the others he's about to join and the back is real nice and clean. No creases so I'm a happy camper. So what do we know about Ed? Nicknamed 'Sonny", he was a stay-at-home defenceman who never really made a huge impact on the ice (237 games played, 37 points) and was a year away from his final skate on NHL ice. He was probably best known as the captain for the University of Toronto Varsity Blues men's team in 1946 and '47 and was referred to by his teammates as "the best player on the ice". He was inducted to their Hall of Fame in 2006, shortly before he passed away. It's a card like this that really shows just how cool a set like this is. 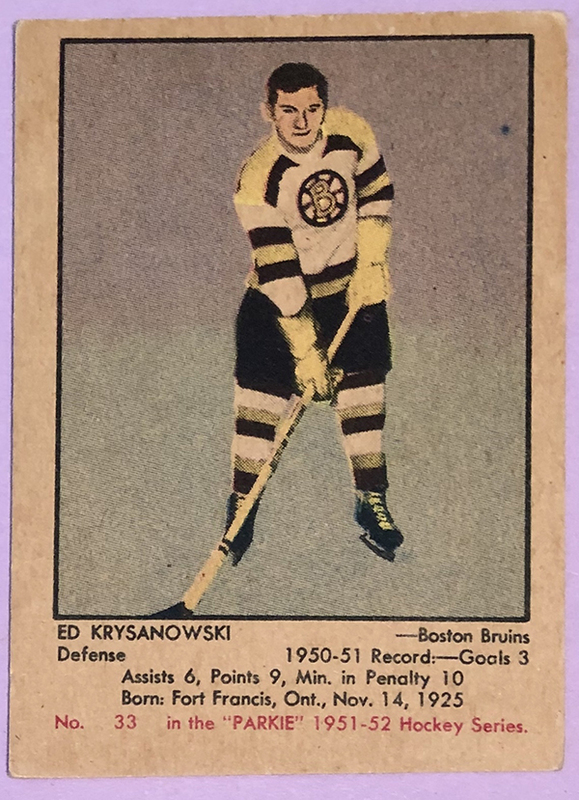 Krysanowski would likely be lost in the shuffle in today's hobby card world (heck, he might not even be high enough on the depth chart to garner a card) but in this iconic Parkie set.....he gets to sit alongside some of the absolute greats in the game. It's a great start to the Parkie Project this year. I have a good feeling I'll be adding another card sooner than later. These pieces look great in person. It's so annoying when I come across a card and the dealer doesn't really want to sell it. But I'd be lying if I said I never brought a card to a show that I was only willing to trade/sell it if the right price came along.